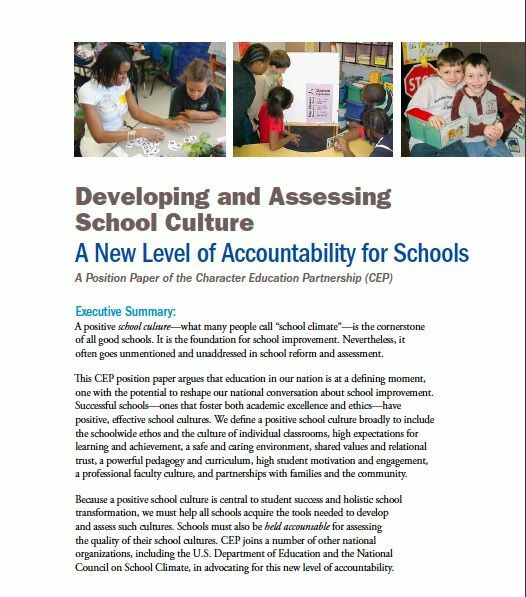 This 8-page CEP position paper argues that education in our nation is at a defining moment, one with the potential to reshape our national conversation about school improvement. Successful schools–ones that foster both academic excellence and ethics–have positive school cultures (or “climates”). CEP defines a positive school culture broadly to include all aspects of school life, including a safe and caring environment, a powerful pedagogy and curriculum, student motivation and engagement, professional faculty culture and relational trust, parent partnerships, and community collaboration. The paper presents case studies and educational research showing the impact of school culture on students’ academic achievement and social behavior. Because a positive school culture is central to student success, the authors argue we must address how to help all schools develop effective cultures. Since what gets measured matters, schools must also be held accountable for having positive school cultures and must have tools for assessing their culture. If we are to prepare students to be lifelong learners and 21st century ethical citizens, we must develop a new “school report card” that includes not only test scores but also concrete indicators of the quality of school culture.